God called for a meeting of all the peoples of the world to assign them their lands. The Georgians were late and the last to turn up for God’s meeting and God said to them “there’s no land left! Why were you late?” The Georgians said they were worshipping Him and were late as they wanted to finish their prayers before coming for the meeting. 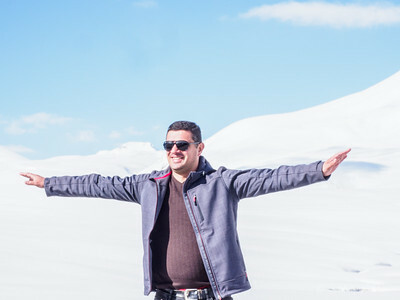 On hearing this God thought “Oh dear I have to give them a land, after all they were praising me” and God said “Hmm … I have no land left except a little piece of paradise that I actually wanted to keep for myself as there is snow, desert, green pastures, mountains, lakes and just a little bit of everything”. And that folks is how Georgia went to the Georgians! And with that delightful tale our Georgian adventure began seamlessly as our Armenian one ended. (Please see earlier post for an account of our Armenia visit). After the border formalities and another close scrutiny of our passports, we walked over to the waiting gentle Georgita and Nino with her flaming red hair. Almost as soon as we got into our car, Nino was regaling us with stories. She was so energetic and bubbly and it never waned in all our days here! There was a familiarity about Nino which I couldn’t quite place until S later remarked – ‘Don’t you think she looks like Jodie Foster?’ Ha! That was why she looked ‘familiar’. She peppered us with questions and told us many interesting facts and stories in equal measure. “Did you know that Georgia is the cradle of wine-making?”, Nino asks. The French would dispute this of course. But Georgia has been making wine using the ancient ‘Qvevri’ method for almost 8000 years. We did see a ‘qvevri’ in the Armenian museum – it was one of the relics that were found when Lake Sevan was partially drained. So we understood what it was when Nino spoke about the qvevri wine-making method which began in Georgia. It is a large oval-shaped clay vessel which is then buried in the ground up to its neck. The word ‘Qvevri’ means ‘that which is buried’. The wine making process takes place within the Qvevri, from fermentation right through to maturation, with skins, stems and all “to create wines of exceptional flavour, complexity and colour”. We were to get well acquainted with the Superavi (red) variety during our stay. 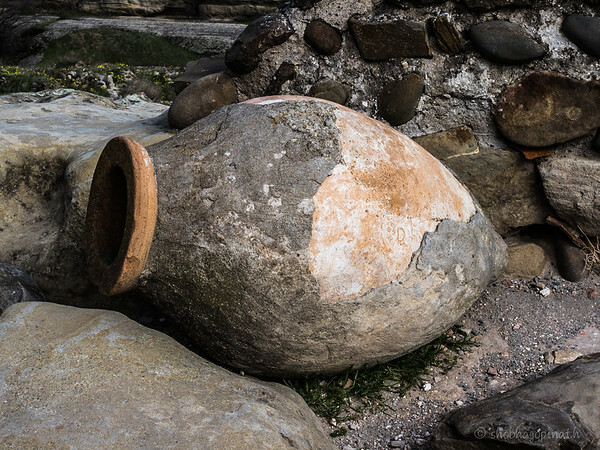 Qvevri wine-making was placed in the UNESCO Intangible Cultural Heritage list in 2013. We had a long day ahead of us today. 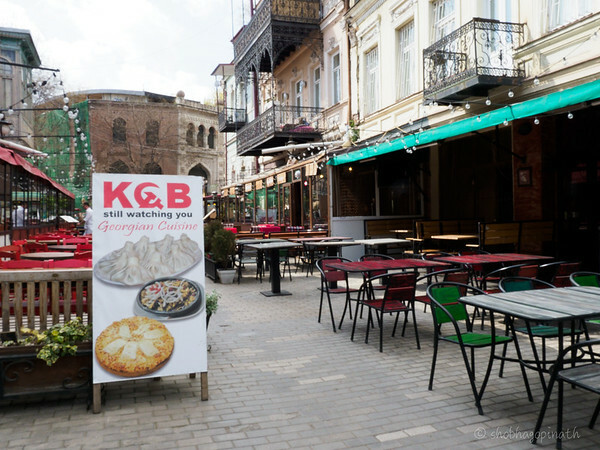 We’d be stopping in Tbilisi for a museum visit and lunch and then heading north-east to Kazbegi, close to the Russian border making stops along the way. Georgia has been under Mongol, Persian and Russian control. 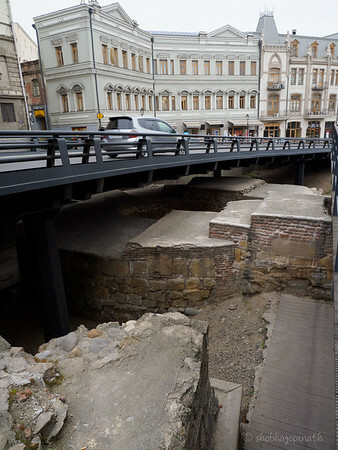 Its capital Tbilisi had been destroyed and rebuilt 30 times. Today it is a thriving modern capital with a mix of modern, ancient and Soviet-style architecture. We spent a couple of hours in the museum which once again had us amazed at the wealth of history and culture. 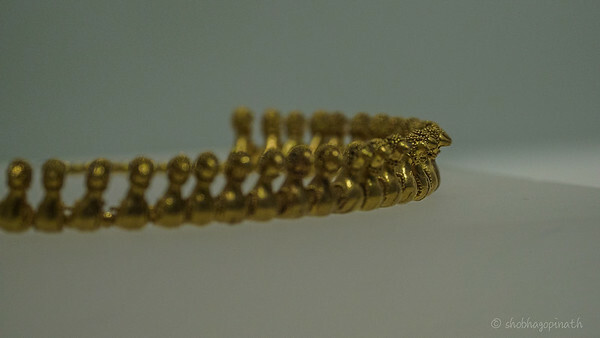 The Bronze Age artifacts were nothing short of stunning. 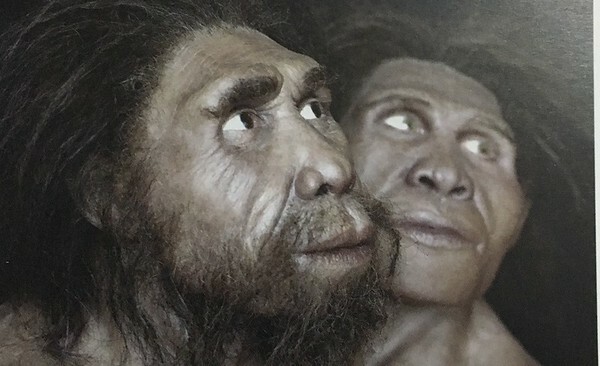 We were to also learn that the remains of first ‘European man’ (Hominid Erectus) was found in Georgia. After this fascinating excursion, we went for lunch at a lovely place called ‘The Bread House’ known for their freshly baked breads. I absolutely loved the pork and potato dish called ‘ojakhuri’ which was our mains. Simply delicious. We headed north on the great Georgian Military Highway after lunch – exploring Tbilisi would have to wait for our return trip in a few days. 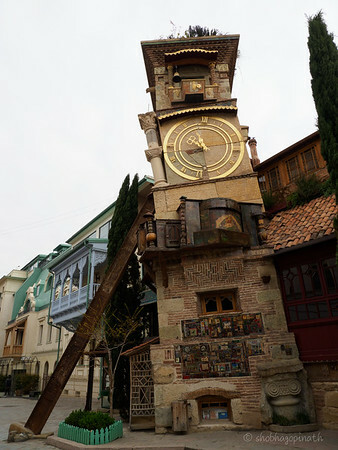 Our first stop was the city of Mtskheta, the ancient capital of Georgia which has two UNESCO heritage sites. 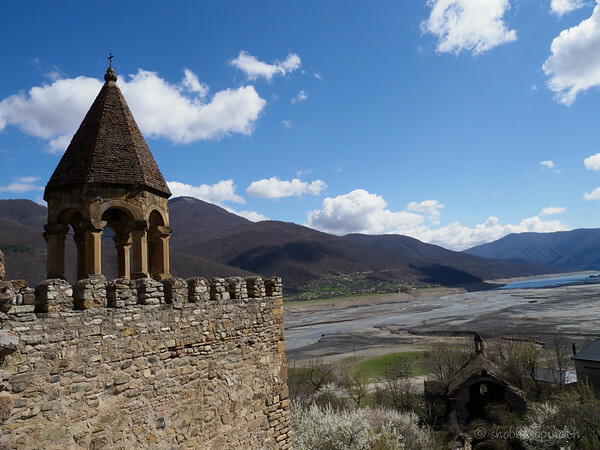 We visited the Jvari Monastery located on a mountaintop with a view of the confluence of the Mtkvari and Aragvi. 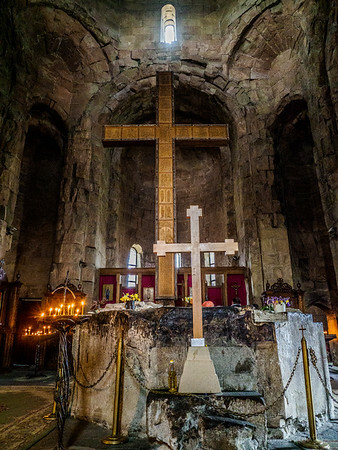 To Georgians, this is one of the holiest of sites as it was here that St Nino converted King Mirian to christianity and he planted a wooden cross to signify that important day. St Nino was one of the three nuns who had escaped persecution in Rome. Her companions, Hripsime and Gayana were tortured and killed in Armenia (for Hripsime’s story please see my Armenia post). Nune or Nino as she came to be known later made her way to Georgia and brought Christianity to Georgia. The beautiful Svetitskhoveli Cathedral was the second UNESCO site we visited. 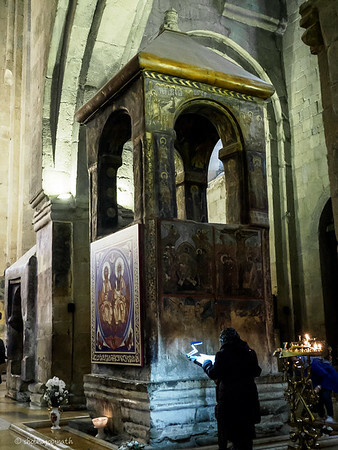 It is believed that Christ’s robe is buried here. Sidonia was a young Jewish woman from Mtskheta. Her brother was present at the crucifixion of Jesus Christ and he bribed the roman guards for Christ’s robe. 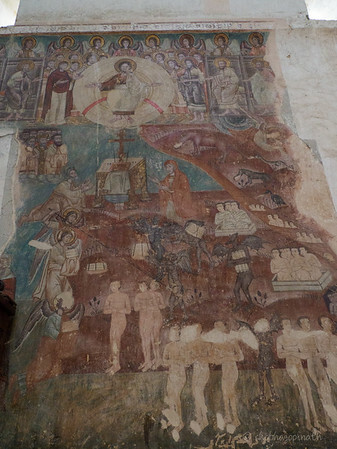 He returned to Mtskheta with the robe and his sister, Sidonia, who was then a recent Christian convert, asked to see it. As soon as she held the robe, she passed away in “a passion of faith”. It was impossible to extricate the robe from her grasp so they buried her with it. It is also believed that later when they were building the cathedral, the column intended to be at the centre of the church could not be moved. St Nino prayed in an all night vigil and the column miraculously moved and hovered over Sidonia’s burial site. The column now stands over the burial site and has worked many miracles over the years. 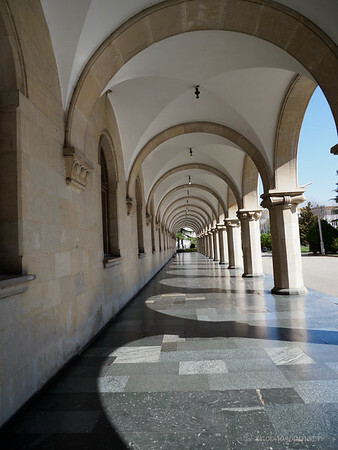 ’Svetitskhoveli’ means “life-giving column”. The weather had turned and it was raining hard and quite windy as we drove to Kazbegi. 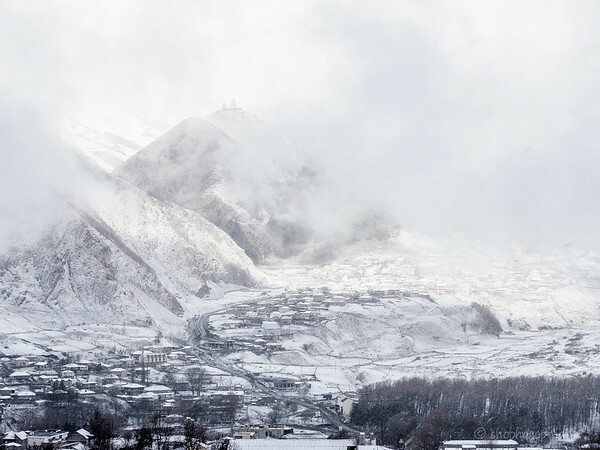 We were supposed to have stopped at Ananuri but with the weather the way it was, it was decided that we push ahead. As we approached the ski resort of Gudauri, it started snowing! So it is true that Georgia has diverse climates. The country’s west is humid and hot, while the east is dry, there are lowlands and rainforests and swamps and beautiful coastlines, semi-deserts and amazing mountains. Just as God said – a little bit of everything! We stopped at the Russo-Georgian Friendship Memorial and halfway walking up we had to turn back. Not prepared for a blizzard, we weren’t properly attired and shivered and froze as it was sleeting so hard. Nino, of course, was surprised as she looked back to find us gesturing for her to turn back. It was enough that we saw it from a distance. It was late evening by the time we pulled up at the hotel. 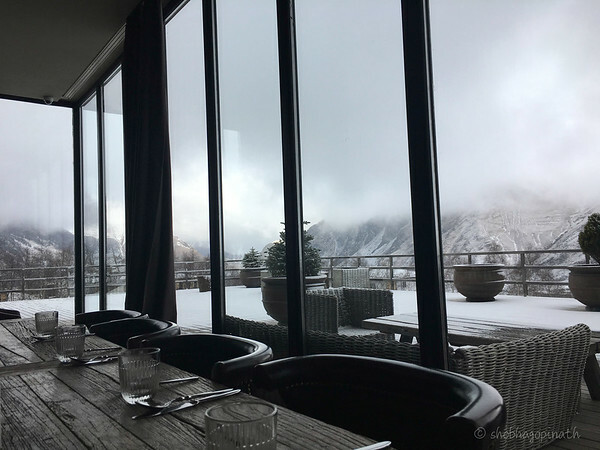 According to the lady at the front desk, we had a great view of Mt Kazbek from our room except this evening the mighty mountain was completely obliterated from view because of the snow storm. We warmed ourselves by the cosy fireplace before a sumptuous buffet dinner. 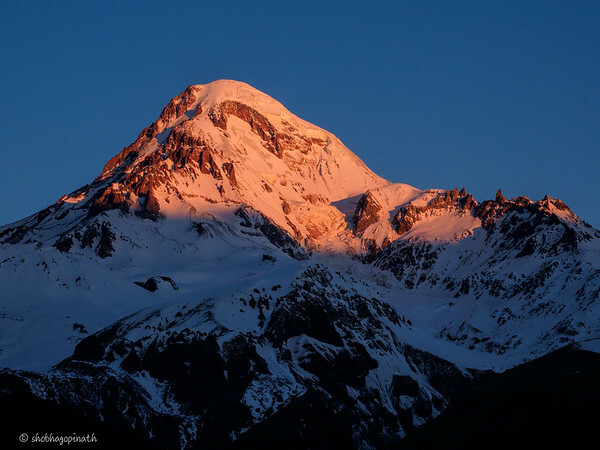 We were up early hoping to capture the iconic image of the sun’s rays hitting Mt Kazbek. 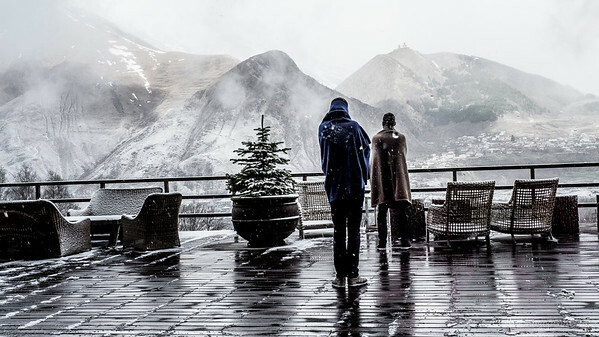 Unfortunately, it was bleak and the mountain shrouded by a thick blanket of clouds. That’s nature for you. You can’t pin your hopes on perfect weather and very philosophically told ourselves, there are great and dramatic images to be had even in inclement weather. 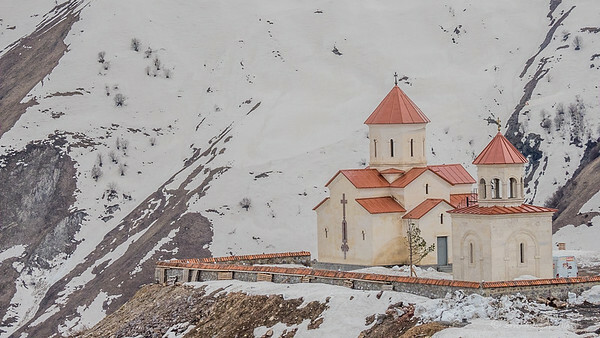 We sat watching as the clouds swirled around the mountain top sometimes revealing the Gergeti Trinity church atop it and at other times we couldn’t even make out that there was a mountain in front of us. It was still like that when we set off to the mountain church, this time properly attired for the wintry conditions. We had a choice – we could either trek to the top or we could take a 4×4. With the weather this bad, we opted for the latter and drove up a narrow and slippery mountain road. The clouds started lifting and it stopped snowing, which was great as we could finally see Mt Kazbek emerge across the valley from us. Before we got to the top, we were asked again if we would like to hike the last stretch. I decided to do it and so Nino and I jumped off and walked. The hike up – almost there! We spent some time up there, taking in the view and the fresh air while also taking loads of photographs and just chatting. It was so lovely. We made our slow way down behind a convoy of 4x4s and hopped off at the village and walked around . The weather had changed considerably from yesterday and the sun was out – although we could not feel its warmth. After a short walkabout, we drove out to another village called Sno. If you blink, you’ll miss this little village. Sno has a 16th century fortress but the real unique thing about it for me was the giant sculptures of Georgia’s prominent writers erected in a field, Easter Island-like. 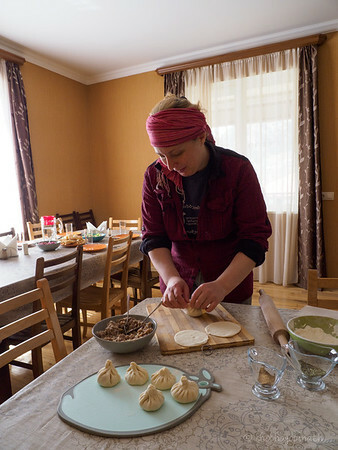 We were to have visited a felt-maker but due to a personal emergency she was not available and plans were made for us to learn how to make ‘Khinkali’ instead – a favourite Georgian dumpling – at the home of one of the locals. We had a go at it and while imperfect it was perfectly edible. Traditionally the perfect khinkali should have 17 twirls – it’s tricky that! After the khinkali-making ‘masterclass’ we were treated to an amazing home cooked meal. It was simple yet so delicious. Our imperfectly-shaped khinkalis were served too. We got to know Nino and Georgita a little bit. Nino is clearly a talented, driven, hardworking and ambitious young woman. She had a very athletic build and it was when our conversation turned to exercise that we discovered to our pleasant surprise that she was Georgia’s champion body-builder in 2015! It was difficult to earn a living in sports so she used her linguistic talents to become a tour guide. She speaks fluent Georgian, Russian and English and is now learning Mandarin. Puts us to shame. Georgita, we learnt was only 39 and was going to be a proud grandfather soon! He married young and showed us pictures of his beautiful family. Georgita makes his own wine and ‘chacha’ (Georgian brandy) – it is an annual ‘thing’ for him. We learnt about the tradition of ’Supra’ – an extravagant Georgian feast wihich entailed a lot of drinking. You can look it up – it sounds like a feast that beats all feasts! We tried to use the few Georgian words we learnt and I kept getting ‘Hello’ (Gamarjoba) and ‘Cheers’ (Gaumarjos) mixed up. The only word we used frequently, fluently and correctly was ‘Thank you’ (Madloba) and ‘Thank you very much (Didi Madloba). It was freezing when we got out of the house and into the car and Georgita whisks out a hip flask and tiny ‘qvevri’ claypots and pours each of us a little ‘chacha’ to warm up. We had to down it in one and it definitely warmed us up. It was chacha that he had made himself. The next morning we were up early once again, hoping to catch sunrise and the image of Mt Kazbek’s peak as the sun’s rays fall on it. This morning was our lucky morning. We jumped out of bed and ran out in bathrobes and clicked away. Our next door neighbour ran out in his undies … I can only imagine how frozen he must’ve been. We ran back to put on more layers, threw on scarfs and beanies and the bathrobe on top of everything. It was well worth standing in the cold as the scene was simply magical! Each second the scene and the colours changed as the sun rose. I posted one of the pics on Instagram and a cousin asked “Beautiful pic – what effect is this?” thinking I might have used a filter. It was all natural and it truly was spectacular. Once it became white light as the sun rose, we got ready, packed and went to get some breakfast and hot coffee. 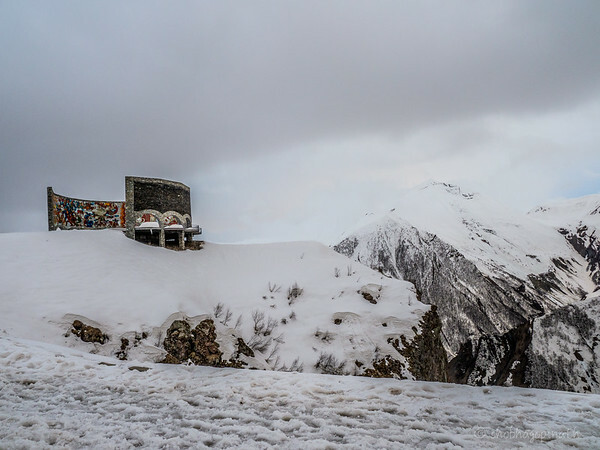 It was a lovely experience in Kazbegi and now we make our way back to Tbilisi, making stops along the way of course. On our way to Gori, the birth place of Stalin (yes, the Joseph Stalin, dictator, ruler of Russia, was Georgian) we stopped to see yet another ancient site, this time the Ananuri fortress and churches, which are waiting conferment as UNESCO Heritage sites. 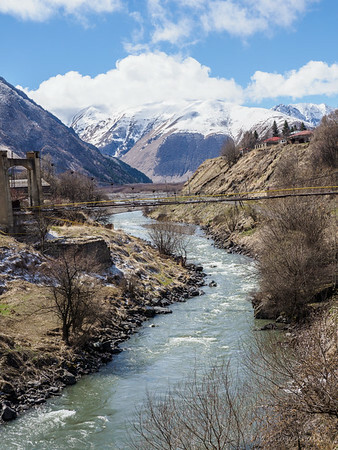 During Soviet times, the government decided to build the Zhinvali Hydroelectric Power Plant and a water reservoir. According to the preliminary plan, the Ananuri Fortress was to be submerged too! The Georgian public protested, and the height of the dam was decreased, leaving the Fortress to stand on the shores of a large mountain lake. 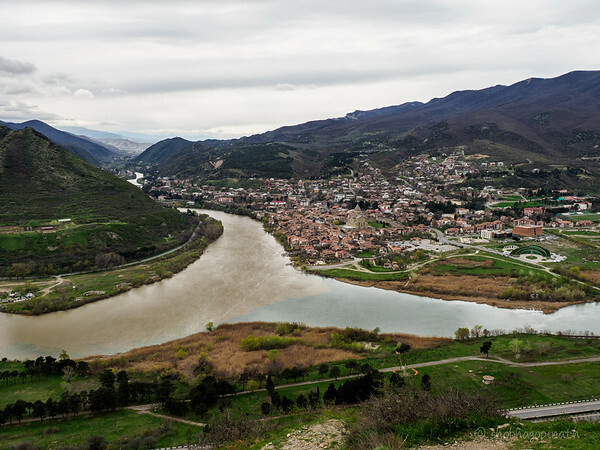 Georgia’s infamous son, was born in Gori. 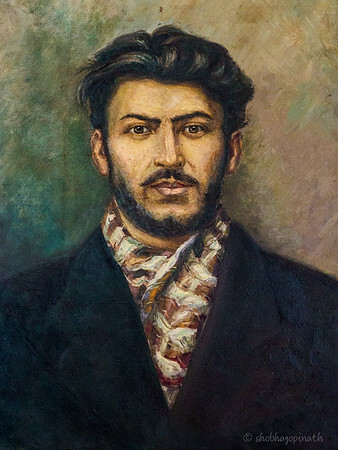 Stalin was the son of a shoemaker and had come from humble beginnings. We visited the Stalin museum. It was run in a Soviet-like manner. You couldn’t visit the museum without a guide. The English speaking guide was not available, so we asked for a Georgian-speaking guide with Nino as translator. Our museum guide was not to be trifled with. 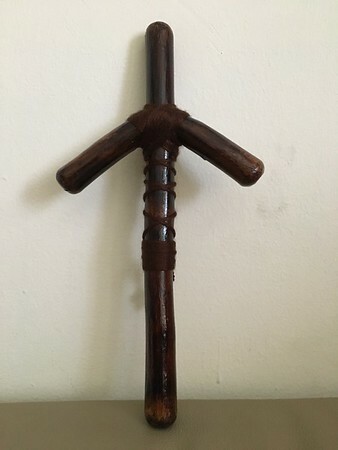 She carried a long pointer and pointed at various objects of interests and would also intermittently hit her thigh with it, when we lingered too long or didn’t catch up with her pronto! Quite amusing. She also did not appreciate Nino giving longer explanations and background information than her brief narration. So it was that we kind of raced through the museum. Nino did say we could go through it again if we wanted to take our time but we declined. We stopped by the museum shop and it seems that today Stalin has become just another capitalist commodity to be marketed with Stalin mugs, keychains, t-shirts and fridge magnets. 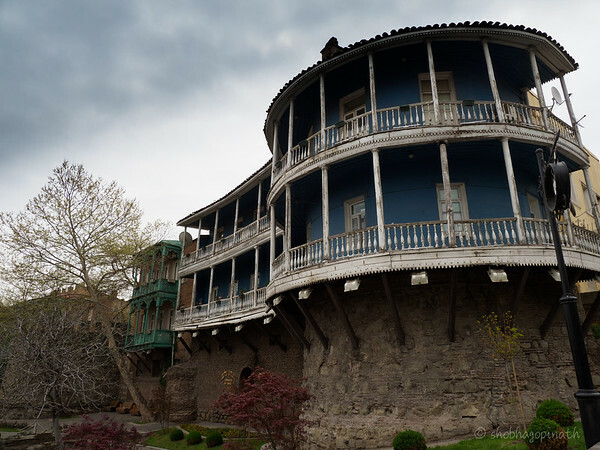 The city of Gori has preserved the home where Stalin’s parents’ rented a single room and built a mausoleum-like structure around it. They have also kept his bullet-proof green train carriage. Stalin turned the Soviet Union from a peasant economy into an industrial powerhouse “taking it with the plough and leaving it with nuclear weapons” as Churchill said. But millions died in his gulags and lived in fear of his secret police. Still, there are many in Russia and the former Soviet Union who still respect and admire him. When the Georgian government decided to remove the Stalin statue from Gori’s central square in 2010, they did so at night. 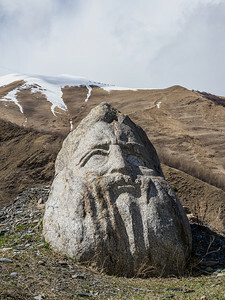 Uplistsikhe, literally ‘Fortress of God’, is an ancient rock-hewn town which played a significant role in Georgian history over a period of approximately 3,000 years. Archaeological excavations have revealed extraordinary artifacts dating from the late Bronze Age all the way up to the late Middle Ages. It was fascinating just walking around these caves. A secret tunnel was found and passage through it has now been made easy with a staircase. 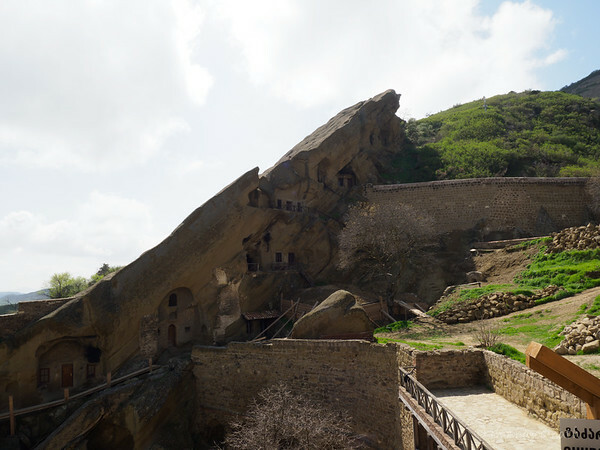 After our exploration of the caves it was a straight run to Tbilisi. We checked in and crashed. We discovered that we were going to celebrate Easter again! 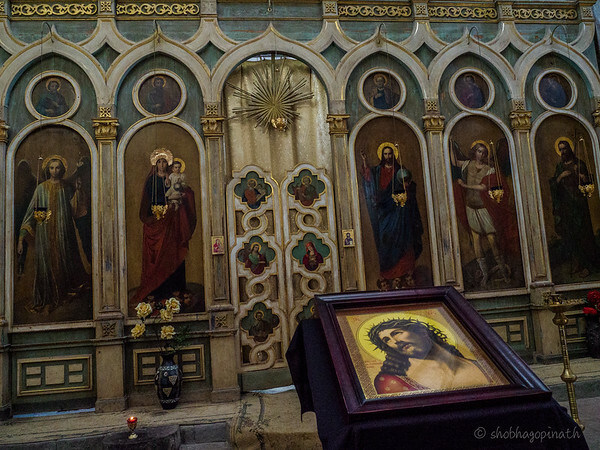 The Orthodox Christians which Georgians are, were celebrating it this weekend. Good Friday is called Red Friday as it is the day the eggs are dyed red. Georgians too have a similar custom to the Armenians of an ‘egg fight’. Today we did a walking tour of Tbilisi. Our hotel was in the main Rustaveli Avenue. This, Nino tells us, is where the Rose Revolution took place. It is almost impossible to separate the politics of a place with the place. The Rose Revolution was just a headline news item to me when it happened. The significance of the recent past of a country takes on new meaning when you visit it. This was history made in your lifetime. 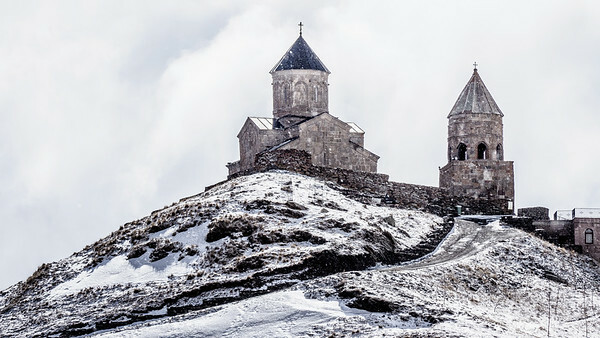 Places like Armenia and Georgia and all countries that have known strife and conflict and finally found peace, are shaped by their experiences. It is important to understand what they have endured to appreciate who they are today. So as we walked down Rustaveli, I could imagine how momentous a time it would have been as the protesters marched into Parliament armed with only a single rose, resulting in the ousting of Eduard Shevardnadze. And we ended up for lunch was at the Old Mekethi – which had a great city view. Another delicious meal and great conversation about traditions and cultural expectations of women. We continued our tour after lunch and stopped by a small batik workshop. 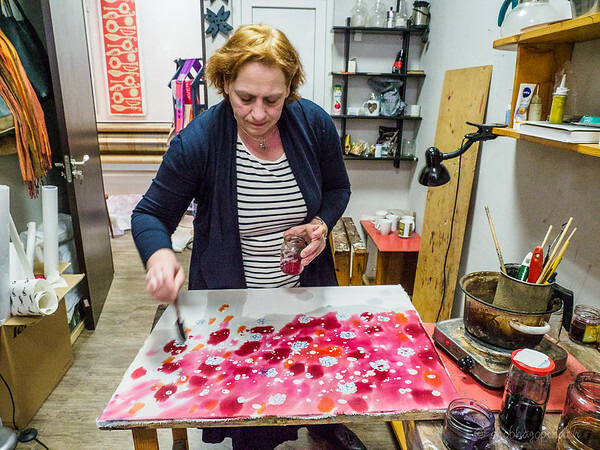 We were quite surprised that there was interest in batik painting in Tbilisi. Irma, the lady who owned the business was so passionate about her work. When she heard we were from Malaysia/Singapore – she was so surprised and said oh I don’t have to tell you about batik! Her designs were interesting – batik with a Georgian twist. We bought scarves from her. We learnt a new Georgian phrase from Georgita – ‘Shveedobashi’ (sp?) – which means let ‘whatever you buy serve you well’. 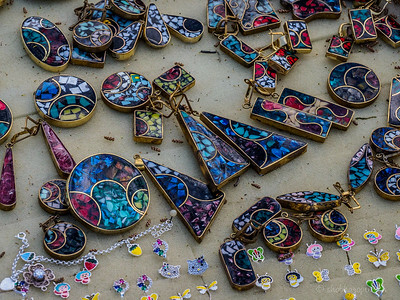 The flea market also known as the Dry Bridge market began in the post Soviet era. 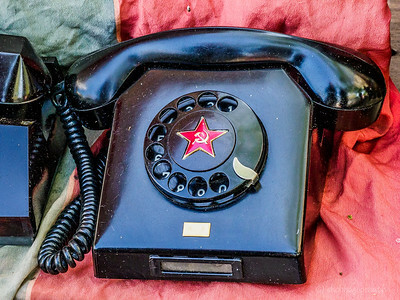 When the Soviet Union collapsed, many lost their jobs and had to resort to selling their prized possessions. It was a difficult time then. Amidst the euphoria of the collapse, there was also sadness and many missed the job security that the Soviet regime afforded everyone. The market near the Dry Bridge continues today as a thriving flea market. 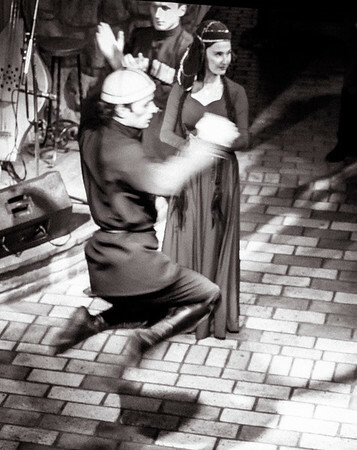 That evening we thought experiencing a performance of traditional Georgian song and dance might be interesting. Nino made a booking at a well-known restaurant called Tsiskili. We were to take a taxi there. I’d asked if it was safe to do so, and the answer was ‘very safe’. Always ask a woman this question. A woman will always give another woman an honest answer. Both Nino and the lady at the front desk assured us of this. This made me wonder what happened to the notorious Georgian gangs. Apparently the place was cleaned up after the Rose Revolution and Mikheil Saakashvilicame into power and the mafia and other gangs have moved to Russia or Ukraine. Hmm. Anyway, our taxi driver was indeed a very nice man named Robert, an great admirer of Singapore, who deposited us safely at the restaurant, gave us his number and asked us to call him for our return ride except it would take him half an hour to get there to pick us up! This restaurant is very popular with locals and tourists alike and reservations need to be made well in advance. So we were lucky to have got a table … except our names weren’t on the list. Long story short, we called Nino who sorted it out and after a bit more of hanging about they squeezed us in the rafters … pity cos we couldn’t get a good view of the dancing. Service was poor, the soup came cold and the food was mediocre and we were most disappointed after having been spoilt with excellent service and food all our days here. Still, the dancing was quite fun even if we could only see it from a funny angle from the top. Davit Gareja is a rock-hewn Georgian Orthodox monastery complex located in the Kakheti region on the semi-desert slopes of Mount Gareja, 70 km southeast of Tbilisi. 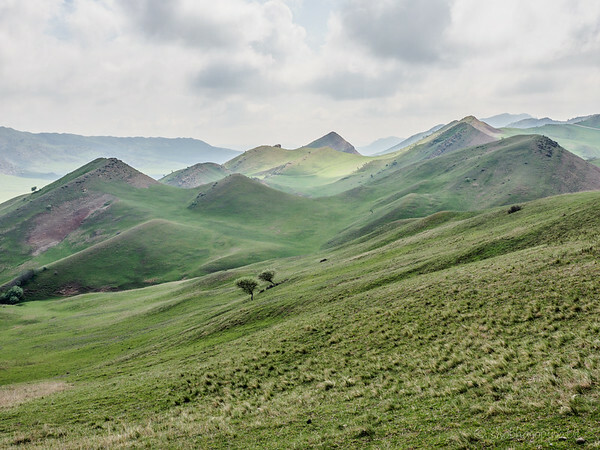 The Soviets re-drew the border and part of it now lies in Azerbaijan. There were many photo stops along our way this morning to this ancient complex. 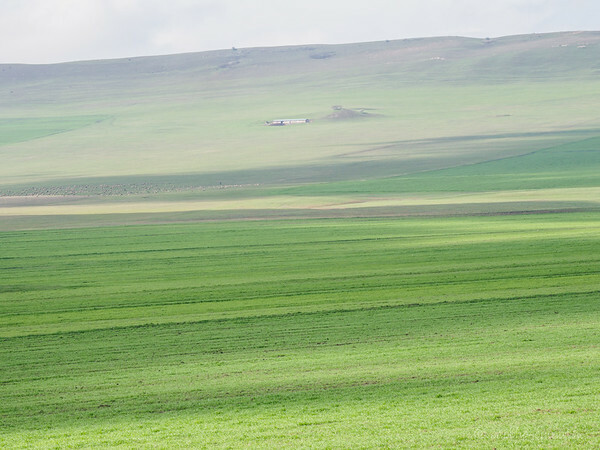 The landscape changed right before our eyes – beautiful rolling hills dotted with farmhouses and sheep. We were already warned by Nino that the walk up would be a steep one and that we could decide when we got there whether we wanted to do the hike or not. S did her homework and had already made the decision not to and had read that hikers need to watch out for vipers. I asked Nino and she very nonchalantly said it would be fine if we just kept to the path. 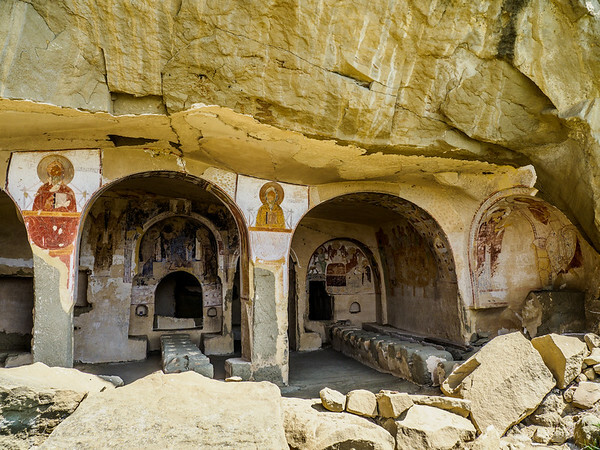 Only two of the fifteen remote monasteries are open to the public. The first one called Lavra is now active again. 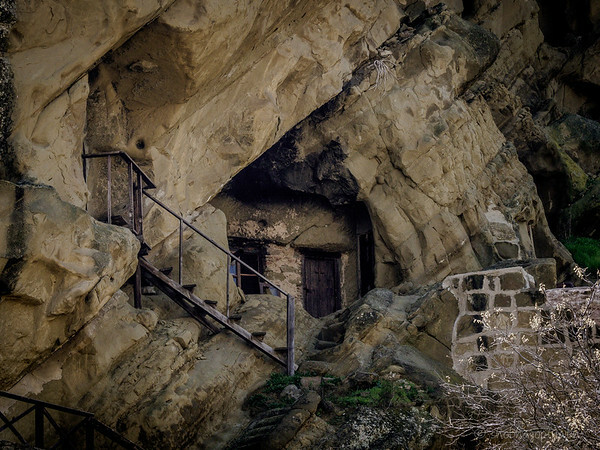 There are buildings within the complex from different periods but the monks’ accommodation are within caves. It was decision-time after our visit to Lavra. 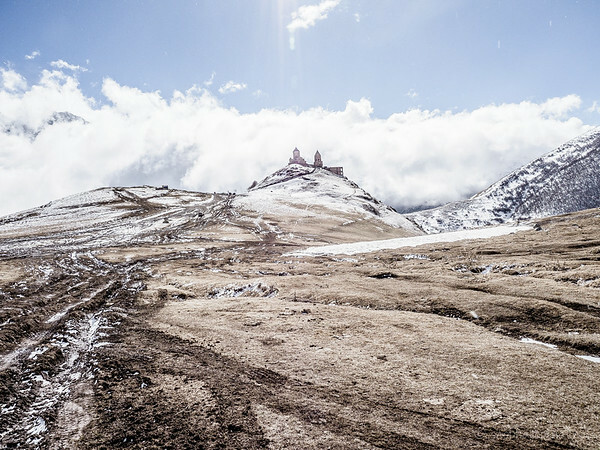 Do I hike up to the Udabno monastery? It was pretty evident that it would not be easy – the gradient was acute and of course there were the vipers to consider and there were areas where we would need to clamber up on all fours … after humming and hawing for a few seconds I decided of course I would. 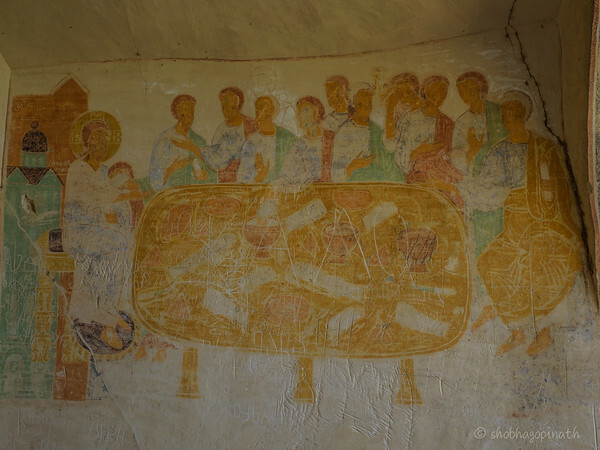 And so it was that S stayed making some beautiful photographs of the Lavra monastery (and prayed for my safe return), while I, led by the very young and agile Nino, hiked up the Gareja mountain to see the ancient cave monastery complex and beautiful frescos. The hike was not easy. 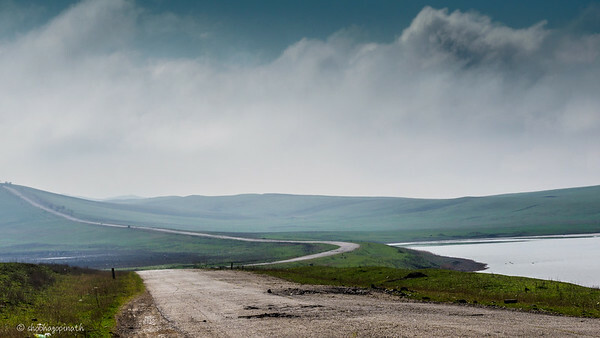 My quads screamed, while my calves sang, trying to keep tune with the song that played in my head as I kept going. Nothing like a hard walk and physical pain to block out all other pain. You think of nothing else but the walk ahead of you. 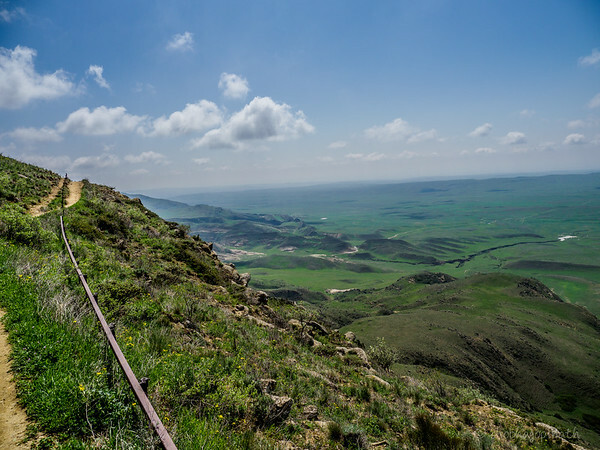 As we climbed the first part, we came across border patrol – Georgian and Azeri. There was a metal railing demarcating the border – you could stand with one foot in each country. As I paused to take photos a polite but firm voice of an Azeri soldier wafted over to where I was standing “Mrs! Please no photos that way”. I hadn’t realised there was a Azeri military base in the direction of my lens. Hundreds of cells, churches, refectories and living quarters are hewn into the rock face at the steep slopes of Mount Gareja. Saint David, an Assyrian Monk, founded the monastic complex in the 6th century. 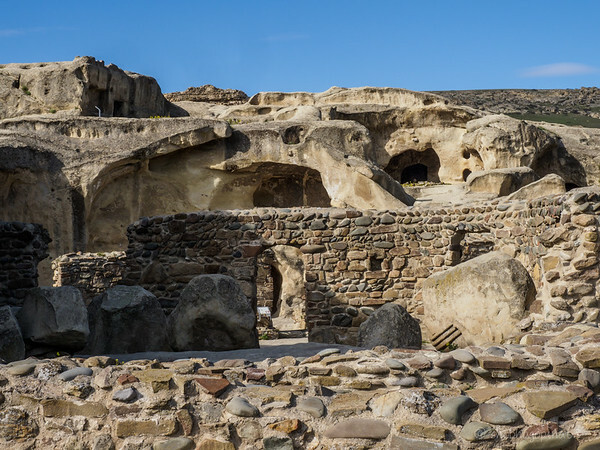 It survived the Mongols and Persian attacks, but during the Soviet rule, the caves were used as military training ground for their war in Afghanistan and much of the caves and the murals were damaged. There was an outcry among Georgians. Later, the Russians, who weren’t too sensitive about religion, re-drew the borders and now part of the complex lies in Azerbaijan. This is a cause of tension between the two countries. 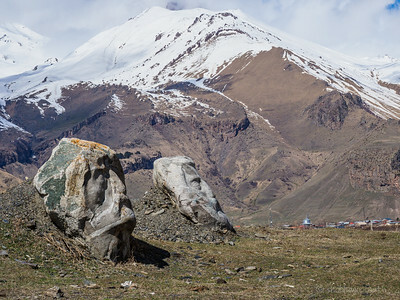 Given the importance of Davit Gareja, the Georgians have offered a land swap but the matter is yet to be resolved. It was enormously satisfying to have done the hike. The way down was harder in many respects as we slid down in some areas. It would’ve have been quite easy to have lost control and tumbled over to Azerbaijan and caused an international incident. I don’t think Singapore Ministry of Foreign Affairs would have found it too amusing. Fortunately the only creature I saw was more frightened of me than I of it – a little tortoise making its way to Azerbaijan. Thankfully no vipers made an appearance even in the many caves we entered to view the murals. Must have been S’s prayers. She was quite relieved to see us safely back. Lunch was at a farmhouse owned by a Polish family. 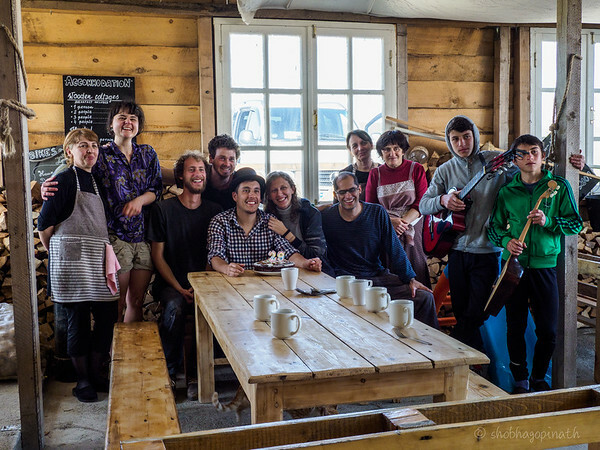 There was an international mix of young people, fetching, carrying, serving and cleaning. They were from all over the world on ‘workaway’ trips. How fantastic for these youngsters – a lovely way to see the world and learn a culture and make new friends. It was the birthday of one of the guys and so we joined in for the cake-cutting. Today was Easter in Georgia which follows the Orthodox Church. We stayed in on this, our last day. We packed, got a Georgian massage in, walked around Rustaveli Avenue, visited Prospero’s Bookshop and generally relaxed. We had a wonderful time. 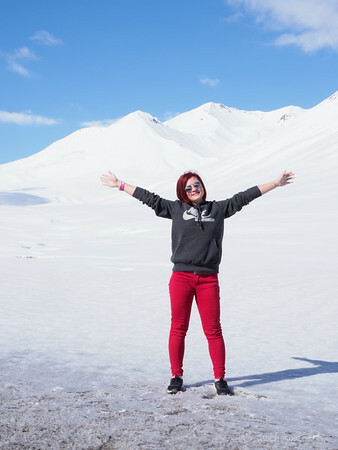 There is a famous Georgian proverb: “A guest is a gift from God” and we were lucky recipients of Georgian warmth and hospitality. Thank you to Sheena Seah of Country Holidays, Singapore, our travel consultant extraordinaire, for the arrangements and invaluable suggestions. Wow! Great stories, great pics, great adventure! We are waiting for your Indonesia trip! Culturally rich and truly beautiful country !